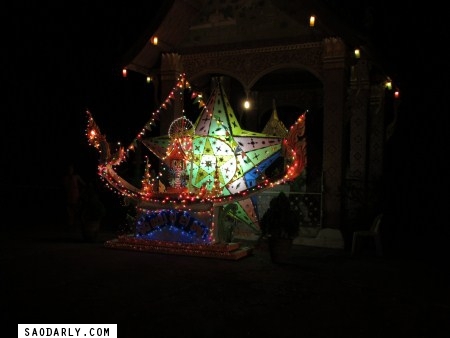 The decorations at Wat Sene was almost 100% completed on the night of Boun Ok Phansa or End of Buddhist Lent. The monks were putting final touches and moving things around to make the temple more presentable. I had a chance to speak with a gentleman from the Ministry of Information and Culture in Vientiane about his design of the boat. Many tourists also gathered around to admire the display and asked various questions. I was more than eager to see the Festival of Lights Procession the next night.